Door Core/ Stile/ Rail Assembly and Sizing – Creative Automation, Inc.
Creative Automation designs complete, automated door core/stile/rail lines for door core assembly and sizing. 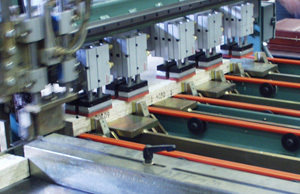 Automatic rail feeding, gluing and pressing. Stiles are fed, glued and pressed automatically. Core is trimmed after.